Think the freight price is crazy on the scissor table? Unfortunately they are big and bulky and expensive to freight. If you have your own freight carrier and you can do cheaper we are happy for you to arrange pickup from Melbourne, Sydney, Brisbane or Perth! Or if you just want to pickup yourself that is no problem but we do need pre-payment and approx. 1-2 hours to get your ready for collection from Melbourne, Perth or Brisbane. 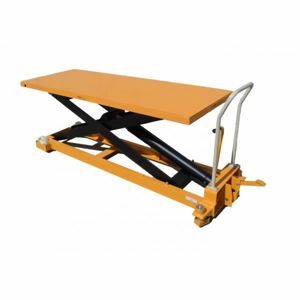 High Lift scissor lift table 1300mm lift height and 350kg capacity. Stock Melbourne, Brisbane & Perth.